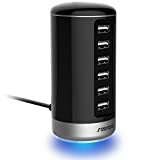 Jelly Comb Multi Port Rapid Smart Charge Tower’s unique stylish design simplifies your home or office décor by eliminating your messy clutter of chargers and wires. The charging station combines all your charging needs into one simple neat charging location. The USB hub also has a rubberized bottom in order to ensure stability even when using all 6 USB ports. The Jelly Comb Charge Tower has the most current “smart” charging ports technology which allow you to efficiently charge various combinations of smartphones and tablets at their optimal output. With 6 Smart Identification USB ports in one centralized location, you avoid the clutter of cables and wires. 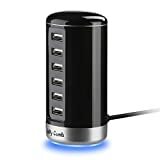 Charge your smart phones, tablets, headphones, speaker, cameras and other USB powered devices with only 1 wall outlet connection. Smart Identification charging ports could automatically matches the maximum charging current designed for your device, and hence minimizes charging time. It will deliver the appropriate current and be close to your original wall charger’s performance. Plug-in anywhere in the world with an automatic voltage adjustment of 110 to 240volts, and charge your different devices without the need for adapters. Which makes this a perfect travel charger. The Jelly Comb 6-port USB charger features a smooth, sleek design and an LED indicator light at the bottom will not distract caused by indicator and giving you a good sleep and lets you know at a glance when the charger is powered up and working for you. 12-Month Warranty. We promise to try our best to offer a satisfactory solution for you. Use your OEM cable or a third-party-certified one (such as MFi) for charging.